They also said that the two explosions were felt 100 miles away. A emergency response trailer was stolen in Western MO...that makes me kind of nervous because all kinds of those trailers are here in Southeastern Missouri and all through the disaster zone. I can't believe they're doing it not once, not twice...BUT THREE TIMES??? Psychopaths! People felt the explosions 100 miles away and they STILL haven't accomplished the mission? I agree with your last statement, Dig. I didn't even think of that, but it makes total sense. I'm not sure how many people would fall into this category, though. My husband and I have had the sickest feelings in our stomachs this week. Things are so far gone. It's not even worth calling it America anymore 'cos it isn't. My heart goes out to everyone in the south. 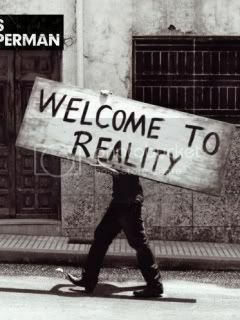 I'm sorry it's happening to you. technology will make available to the leaders of the major nations, a variety of techniques for conducting secret warfare, of which only a bare minimum of the security forces need to be appraised. thoroughly weakening the population (though with a minimum of fatalities) before taking over with its own armed forces. Thanks a lot of great info on that site! Well the last blast will be at 1:00 pm Today....then the 'project' will be complete. The funny thing is on Alex's website there's an article about the Army Corps of Engineers taking more control of water ways. on the Mississippi River and save several towns from being inundated, including Cairo, Illinois. 10 p.m. local time, a Reuters journalist near the site of the action said. apocalyptic billboards popping up nation wide about Christ's Return on may 21st. Im not sure where the six plumes of flame came from. I saw 7.
the "6 seals" search is what turned up the Biblical ref...which i found intriguing. stuff goin on right now with the levees...then nle11 in a few weeks...the billboards, etc. Monday nights explosion had the power of a magnitude 3 on the richter scale..now they say they don't have enough explosives for the third breach so they had to go get more. Now my question is this...why don't they have enough explosives..could it be this last blast (Which sits directly on top of the New Madrid fault line of 1812) needs to be bigger because the other two didn't have the desired effect? I think a lot of you guys are in denial about basic physics. If you look at a typical river valley, there will be a flat area between some hills. The area that is flat is the space that the river historically used during 20, 50, or 100 year floods. During a flood, there is a certain volume of water that has to be somewhere. When they installed the levees, it initially protects the stretch of the river that naturally had the lowest banks from getting flooded, but it also creates a lower capacity for the river to flow in. Ordinarily, there are a lot of wetlands and low, flat areas that are flooded during the wettest months of the year. The U.S. Government is hiding the increase of earthquakes along the New Madrid. After the recent blowing of the dams in SE Missouri, I thought I would keep an eye on the seismic activity in the region. The main site that most people go to is the IRIS interactive map: http://www.iris.edu/seismon/zoom/?view=eveday&lon=-92&lat=37. This map does not show any earthquakes in the New Madrid area in the last month. Under the map it has a button you can click for the last 30 day earthquakes. I believe it only lists earthquakes that are a magnitude 4 or higher. When you click the â€œlast 30 days earthquakesâ€� button you end up here: http://www.iris.edu/seismon/last30.html. The list of earthquakes for May 5, 2011, WORLDWIDE, shows 19, none in the New Madrid area and the most recent is shown as 17:04:29. Next, if you go to the actual USGS site: http://earthquake.usgs.gov/earthquakes/recenteqsus/Quakes/quakes_all.php, you find a listing of all earthquakes in the U.S. for the last 7 days, in the New Madrid area, with a magnitude of 4.0 or higher, there are 4. The most recent earthquake is listed as 21:01:24. There have been none above a 4.0 in the New Madrid area in the last week, until today. This is quite startling and something to keep checking out. It appears to me, that the government is updating the information given to the IRIS monitoring site for their â€˜interactive mapâ€™, however, not all of the earthquakes are being listed. Funny how Missouri wasn't declared a disaster state while the States opposing Missouri (Kentucky and Tennessee) were. We have ruined homes with tremendous amount of flooding but got overlooked. I have been watching the New Madrid and Wabash for years. Here is a site with interactive map. Some of you probably already use it, but here it is anyway. You can click the different "Quick Pick" options and such to see different types of information on the map. You can see the little seismic activity button to the right in the "Quick Picks." For instance, it looks like there was a 3.1 this morning in Arkansas. You can hover the cursor over the circles where activity has been reported on the map to see the intensity and time. The bigger the circles, the higher the intensity. Enjoy. Vatic Note: PLEASE DISTRIBUTE THIS FAR AND WIDE. ITS GENUINELY TIME TO "WAKE UP" or expect to sleep forever. Remember the Iron Mountain Report which strongly suggested using an "ECODESTRUCTION" to move the unwary population toward globalizing, and that was written back in 1966. We know all about HAARP, we know all about creating Tsunami's now with micro nukes, and we know all about the infiltration at key military positions and intel positions by the satanists who are into these sorts of destructions and murder for their cult and religion. Click on that link and remind yourselves of the satanic world you will be living in alien to anything you have ever experienced before, these SICKOS already run NSA, and will be the rulers of the new world they want us to inhabit. A DARK AGES THE LIKES OF WHICH WE HAVE NEVER SEEN BEFORE. They are already half way there when they blew the levees that were not necessary to blow. So this is no longer in the realm of "maybe", they have begun this, they know we know what they are doing, and they don't care. They are committed and that will not change. Now, the question is, "HOW COMMITTED ARE WE?" AND THAT ANSWER will determine our fate. 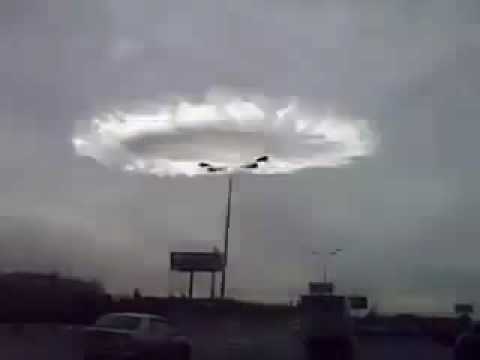 We also know that war games are or were going on when all the tornados began and are still continuing which is an anomoly now in nature which indicates its man made, so all the deaths and destruction can now be directly followed back to those in control of those facilities and operations. Notice FEMA under the SPLC AND ADL DEPT OF HOMELAND SECURITY are no where to be found, no relief, no presence, etc, THEY DO NOT GIVE A SH*T ABOUT YOU OR YOURS, THAT IS THEIR TRADEMARK, no humanity whatsoever. MARK THAT DOWN AS EVIDENCE PLEASE. We now have someone to prosecute and obtain justice for doing these murders. Further, we now know our government is occupied by a foreign power who has already done other acts of terror against US citizens and property. Given all we DO KNOW, its a cake walk to prosecute and this evidence is readily available to be given to any federal or state prosecutor who by law has to pursue such investigation or be liable himself for criminal action under the same laws of the crimes he refused to investigate. So we are building our trap slowly but surely by downloading these pieces of evidence. This is an excellent article. Please read and see were the "loonie toons" running our country intend to take us. DOWNLOAD ALL EVIDENCE of criminal wrong doing in every area. Do not be taken in by elections that are preordained as we have seen since JFK. Know that not one soul supported and given exposure by the press, is a free agent, they will be owned. 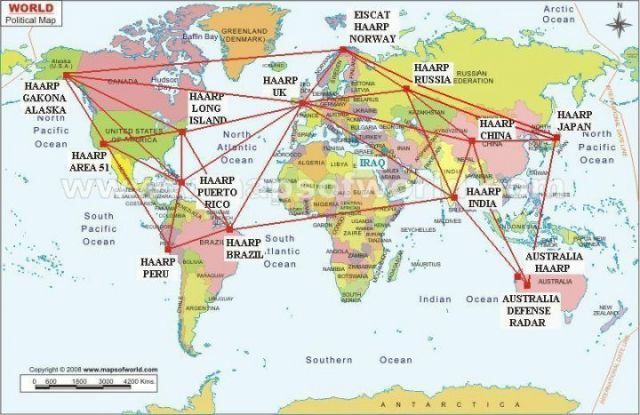 Please note WHICH COUNTRIES HAVE A HAARP FACILITY, AS THEY ARE ALSO NOW OUR ENEMY. Remember we are now going to be "BRUTALLY HONEST"? Using Nature as a weapon against us all. The tornadoes and the storms surrounding the New Madrid Fault have not lessened, people are still suffering badly and there is still no sight of FEMA to help survivors; despite the FACT that FEMA has been on the scene (for the EXERCISE) since Apriil 3-8. HAARP --The High Frequency Active Auroral Research Program based in Gakona Alaska is under constant scrutiny, as researchers track its relationship to weather modification and earthquake activity. 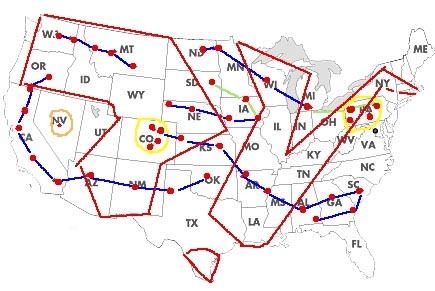 This facility and its substations scattered throughout the U.S. have been tracked by intrepid weather researcher Dutchsinse who has made some startlingly accurate predictions based on the tell-tale radar flares of these facilities, already linked to earthquakes in the area of the New Madrid seismic zone. Subsequent flooding is so severe and unprecedented that locals are even saying it seems like the whole area is sinking. Geoengineering -- This might be the most obvious part of the elite plan for global control. Books like Ecoscience by Obama's science czar, John Holdren; the military plans for Owning The Weather by 2025 ; and the recent Royal Society proclamations all point to a relatively small group of selected sociopaths who would love to play God with our climate, backed by ultra-elite front organizations such as the Bill & Melinda Gates Foundation. As described above, there already has been a conditioning program for people to accept seeing planes spray across the skies. 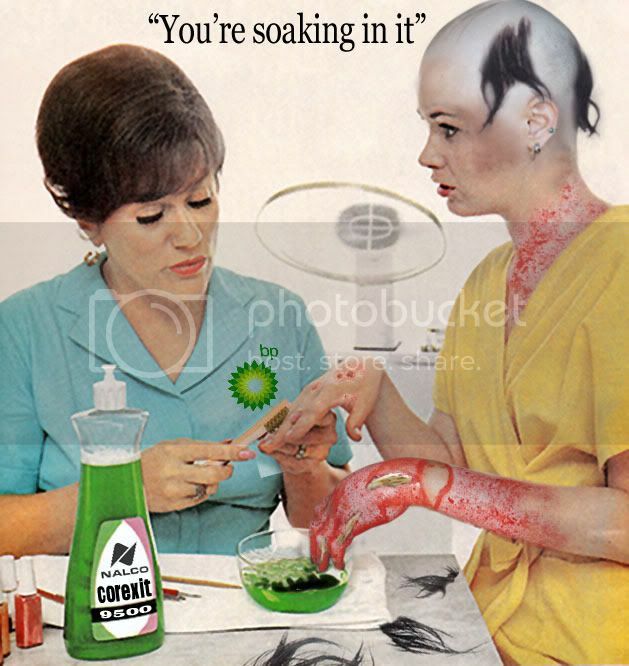 Now, the evidence is in: it is a chemical cocktail which contains dangerous levels of toxic particulates such as barium and aluminum. Certainly Monsanto seems to have accepted this reality, as they were quick to develop an aluminum resistant gene to insert into their GM crops. (VN: Bill Gates owns Monsanto now)The recent mega-twister outbreak, which has led scientists to conduct a disaster autopsy, might also point to evidence of weather modification experiments that are facilitated by the presence of heavy metals in chemtrails that intensify the effect of manipulative EMFs. Big Oil and Gas Fracking -- Since September of 2010, nearly 800 earthquakes rattled Arkansas and the New Madrid Fault Line. The entire state only experienced 38 quakes in 2009. The New Madrid Zone is believed to be a part of a complex of faults that extends down the Mississippi Valley into The Gulf of Mexico. In fact, the oil volcano that was unleashed by the BP disaster last year is thought to be at the southern tip of this volatile area. Not only are oil and gas being extracted from beneath this zone at enormous rates, but an extraction process called fracking is further exacerbating seismic activity in the region and might even trigger a mega-quake. Hydraulic fracturing (fracking) pumps water and chemicals into the ground at a pressurized rate exceeding what the bedrock can withstand, resulting in a microquake that produces rock fractures. A close look at Arkansasâ€™ history of earthquakes and drilling reveals a shockingly noticeable surge in quake frequency following advanced drilling. Fracking is now a global technique for finding natural gas. -The U.S. Navy released images of the future geography of America . . . divided nearly down the middle. (VN: Ok now this is evidence of treason. 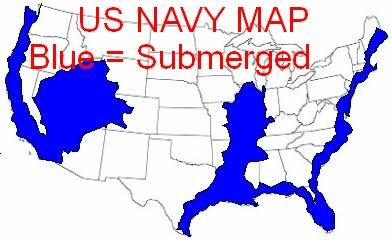 This is a US Navy map, not speculation, its evidence of planned harm and murder of millions of Americans, so now we have the legal and moral right to do the purging of the foreign occupying nations traitors. WE BETTER START CALLING ALL THIS WHAT IT IS. NO MORE DANCING AROUND IT, FOLKS, TIME TO THROW OFF THE MIND CONTROL, AND LOCK AND LOAD, FOCUS ON THE FOREIGN OCCUPYING ELEMENTS OF THIS TREASON AND NO ONE ELSE, YOU KNOW WHO THEY ARE AND ITS NOT OUR GOVERNMENT PER SE, NOTICE THE "DETAINEE HANDBOOKS": FEMA CAMPS RING A BELL? , NOW FOR THE FIRST TIME I AM BEGINNING TO BELEIVE WHAT WE READ ABOUT SHACKLES AND BOXCARS. Much has been made of the massive rise in doomsday bunker purchases, as well as purchases to enter self-sustaining underground communities. This path is certainly not for everyone, as the most serious disasters could last for an indeterminate length of time. Perhaps a better path is to stay mobile, rather than fixed. It is sad that many people have lost their permanent homes during the financial collapse; however, for those in such a position you might just be best suited toward survival. The ability to pick up and go has proven to be important as the fallout from the Fukushima disaster has circled the globe. There is always someplace safe; it is important to identify where that is and be prepared to move when necessary. Rather than "running for one's life" as a cowardly act, this should be viewed as running toward better opportunities when presented with adversity beyond one's control. All true survivalism depends on one's ability to physically adapt, then to have the mental fortitude to make the best from unfortunate circumstances. Some key areas of focus are radiation protection, plug-in scalar technology, orgonite and EMP protection. With recent news from NASA that Comet Elenin is affecting Earth , it would be wise to also move to higher ground if possible. We saved the best survival tactic for last. Ironically, the pooling of resources is the single most effective and inexpensive strategy to ensure your own independence. Disaster preparation can seem like an overwhelming task to take on single-handedly -- much better to befriend people who are already skilled (and well-stocked) in certain areas. Every community already has people well-trained in mechanics, craftsmanship, food production, and tactical weapons. Rather than try the nearly impossible task of gaining skills in all of these areas, offer your current skills, property, or ideas to other key people and strategize about what-if scenarios. Just such a project has begun in New Hampshire. The Free State project is a recruitment for liberty-loving people to move to New Hampshire. You can read their statement of intent to decide if this might be the path for you. This is a brilliant plan for people to connect with other like-minded individuals and carry out a shared goal. This erases the feeling of being alone, which lead so many people to inaction as they see their current neighbors turn a blind-eye to the problems we have outlined above. * Zen Gardner is the Contributing Editor for Alternative News at Before Itâ€™s News, and also posts at ZenGardner.com. Manitoba on Saturday made a deliberate diversion of Assiniboine River water to avoid a wider, uncontrolled flood. The controlled release of water could inundate a 180 square kilometres area east of the city of Portage la Prairie as Assiniboine water runs into the La Salle River watershed. I have been watching the helicorders for quite some time. This does happen on occassion. Either it is an 'oops, someone forgot to change the drum' type thing or something happened that they did not want you to see. However, it only lasted about 5 1/2 minutes and nothing happening after that, so my guess would be the oops.